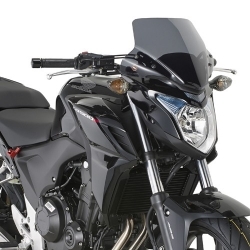 All the wind shields and screens for CB500F 2013-2015 to improve your wind protection. Wind Shields There are 6 products. 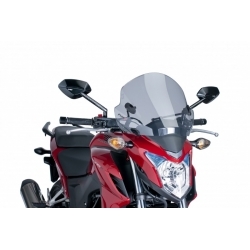 Rafale windshield for CB500F. Improve the aerodynamics of your bike and sets it apart from the others. Manufactured with 3mm. high impact acrylic and available in nine colors. 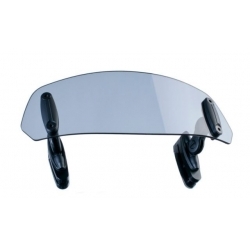 PUIG Street windshields stands out for its quality, ease to mount, and design. 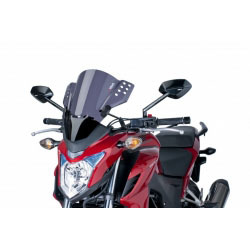 Adaptable visor for your Honda bike. For 3 to 5mm thickness windshields. Mouting with screw or new "clip-on" system. 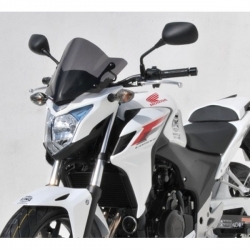 Givi specific windscreen for your Honda CB500F. Smoked design, mouting kit included. Stream windshield for CF500F. Improve the aerodynamics of your bike and sets it apart from the others. Manufactured with 3mm. high impact acrylic and available in four colors. PUIG Street windshields stands out for its quality, ease to mount, and design. Available also the STREAM windshield with visor in smoke. 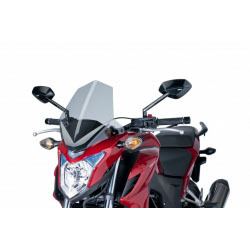 Ermax Sport windshield 29cm for CB500F. Available in different colors and finishes.